Baking has always been one of my favorite things to do. I was first allowed to use the oven when I was about 10, maybe even younger, and would bake cookies, brownies or chocolate cake every chance I got. As I got older, it became my full-time job at my family’s restaurant and, believe it or not, I never really got burned out by it. I did get burned out working with my family but that’s another story. After I left the restaurant I really didn’t have much reason to make cookies, brownies, or chocolate cake because it was just Bob and I for so many years. We were busy growing our business and, frankly, didn’t need the temptation. Now that the girls are older though, I find myself baking on a regular basis again and I’m loving it. At first, it seemed indulgent but then I realized that my girls, like me, love sweets and are going to eat them one way or another. 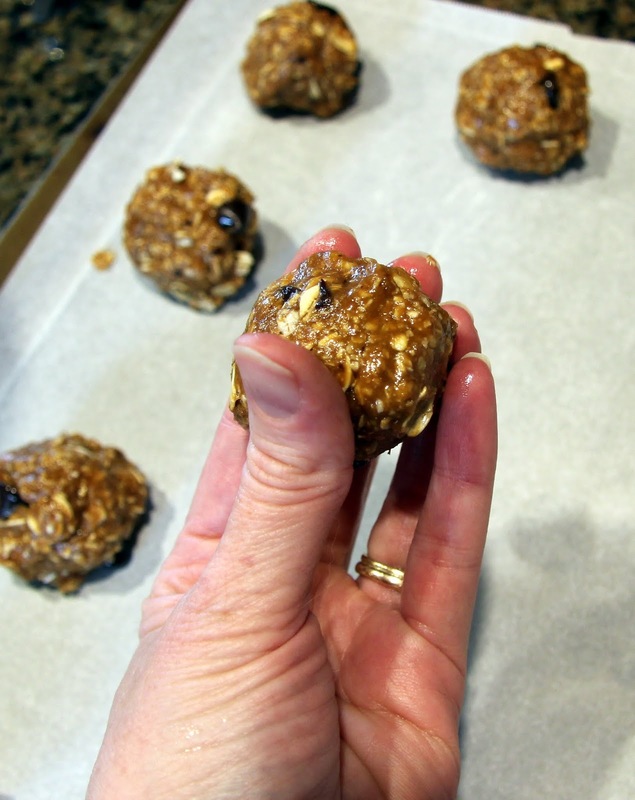 Making them myself allows me to reduce the amount of sugar and increase fiber and nutrients. 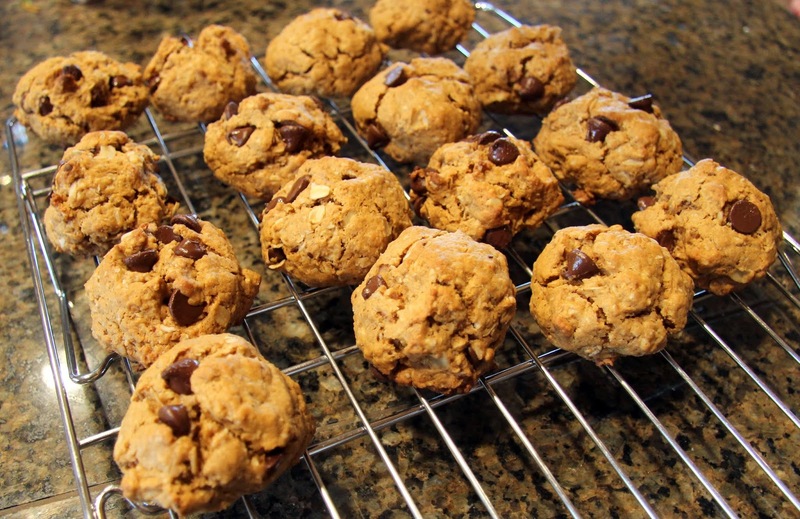 There are two reasons I like these wheat free oatmeal chocolate chip cookies. The first and most important reason is that they are delicious! Especially fresh and warm out of the oven, as all chocolate chip cookies are. 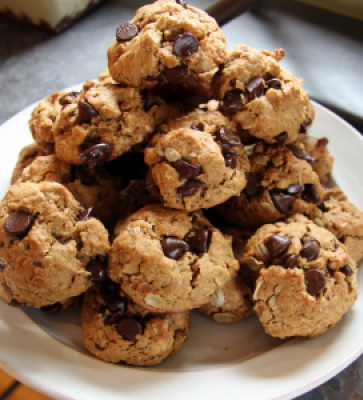 The second is that they are full of really good, healthy ingredients, but, honestly, that’s secondary because they really are a fantastic tasting cookie. Both girls love them and that’s saying a lot because they are very suspicious of me trying to pass something on the healthier side off as a treat. 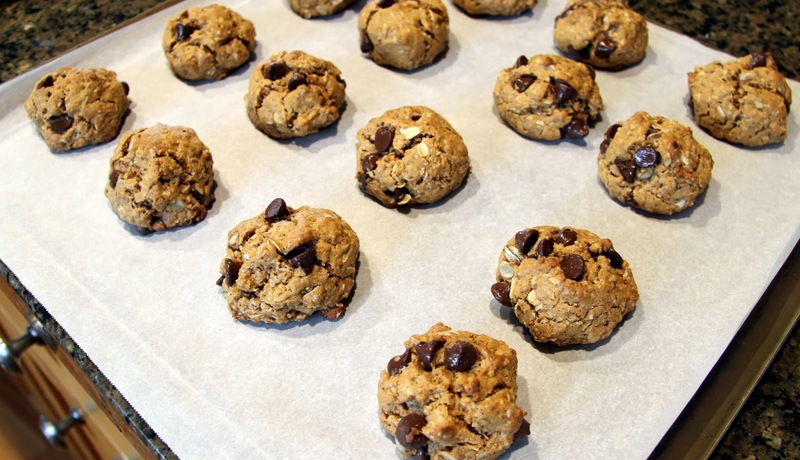 Not that these are completely virtuous but they are a better choice than your average cookie full of white sugar, white flour, and butter, not to mention the trans fats and high fructose corn syrup in store-bought treats. For those of you who are gluten intolerant, these cookies are gluten-free as long as you are sure your oats are gluten-free. Apparently, this is not always the case as some of the major brands are processed alongside grains that contain gluten, such as wheat, so be sure and read your labels. You may be cooking with coconut oil already but, chances are, you’ve never cooked with coconut sugar so let me tell you why I like them both. Organic coconut oil is a good substitute for butter when you don’t mind having a hint of coconut flavor in whatever you’re baking/cooking. You’ve probably heard by now of the many health benefits, the most surprising being that, although it’s a saturated fat, it is composed of medium-chain triglycerides (as opposed to long chain triglycerides in hydrogenated oils) and breaking them down leads to more efficient burning of energy in your body, some experts say it can even lead to weight loss. I like organic coconut sugar because it has a lower glycemic index, meaning it might not lead to the intense rise in blood sugar caused by other sweeteners that, ultimately, lead to crashing and feeling hungrier throughout the day (it’s still sugar, don’t overdo it). It also contains essential B vitamins, magnesium, zinc, iron, and potassium. 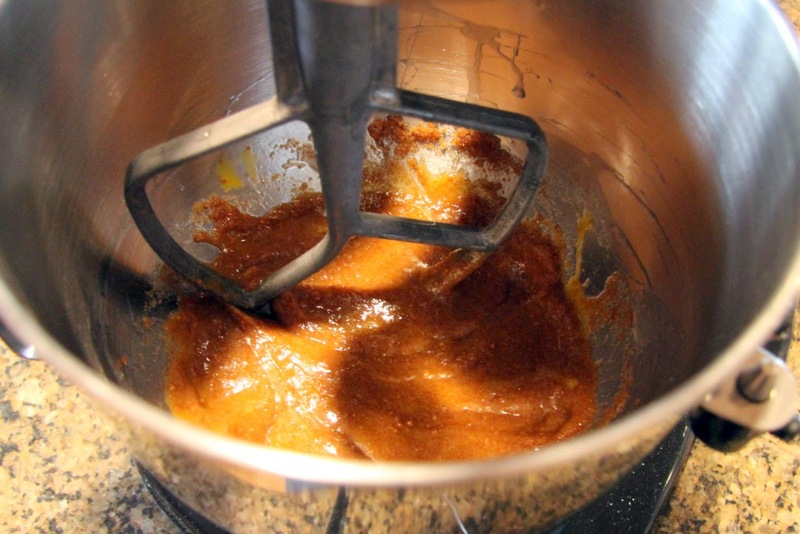 It looks and tastes very similar to brown sugar, with a bit deeper, caramel flavor. 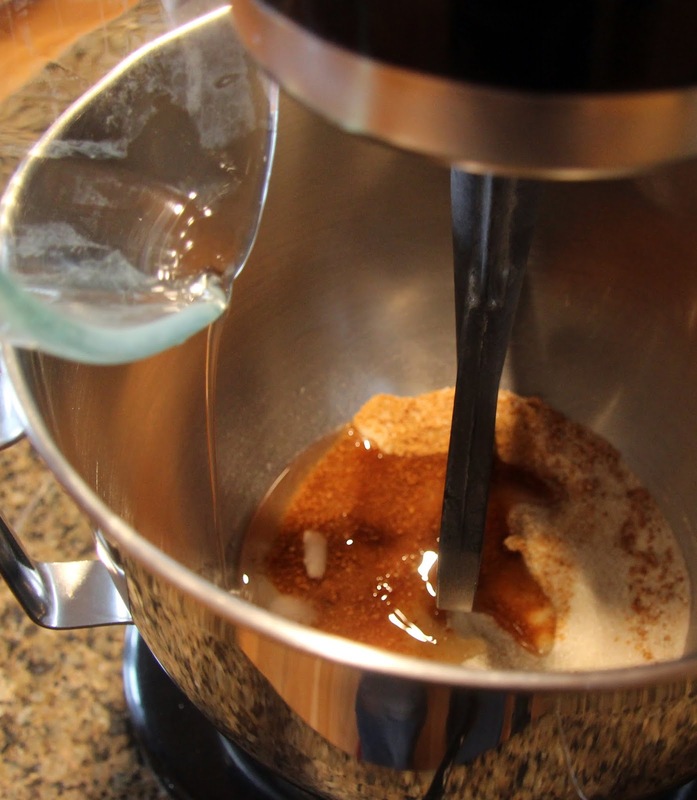 The drawback is, it can be more expensive and harder to find so go ahead and substitute brown sugar if you want. Line 2 cookie sheets (or one at a time) with parchment paper, a silicone mat or cooking spray. 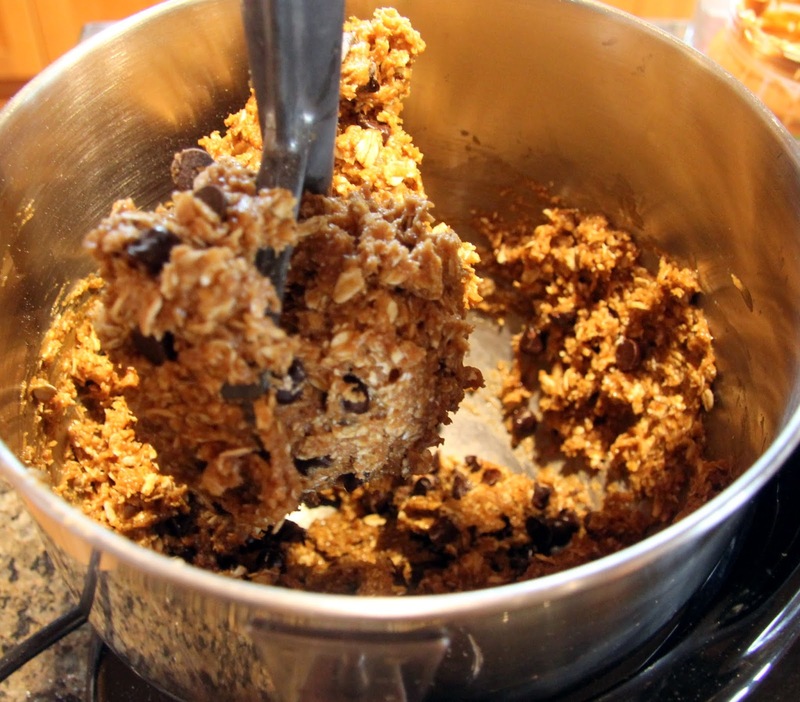 Grind 1 cup oats in food processor or blender until it has a flour-like consistency. This step is optional but will result in a really nice texture. Melt coconut oil in the microwave or over the stove, make sure it’s not hot and add to sugar in a large mixing bowl or stand mixer. Mix until well combined. Add eggs, one at a time, and mix until well combined. Be sure and scrape sides with a rubber spatula occasionally. 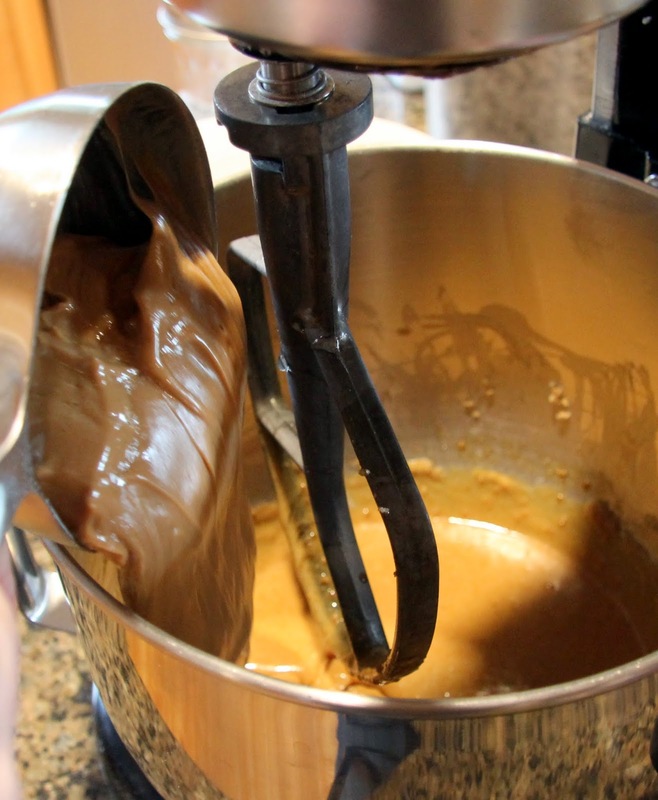 Add nut butter and vanilla extract and mix until well combined. 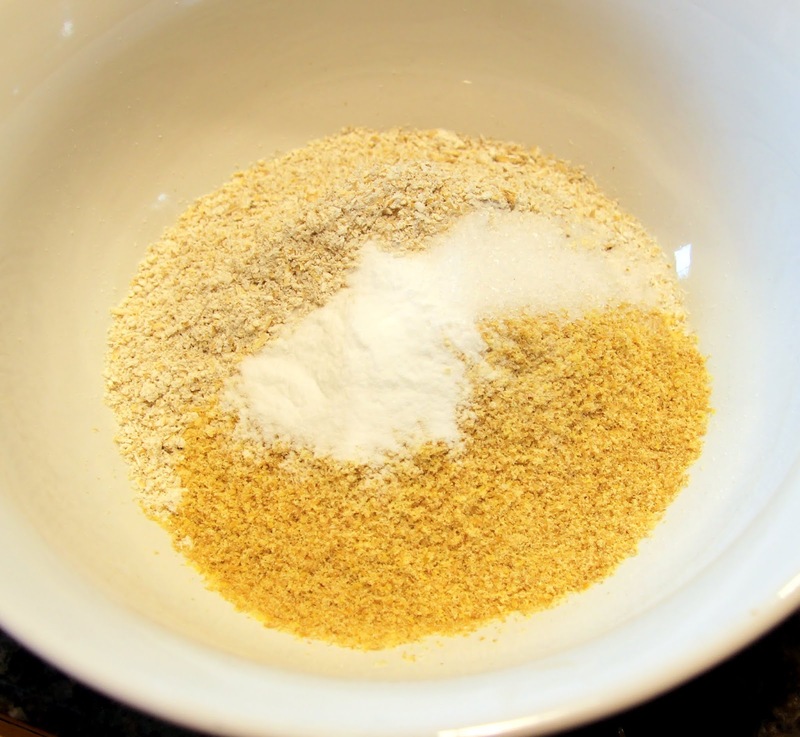 In a small bowl, combine oat flour, oats, flax meal, salt and baking soda, stir together. Gradually, add dry mixture to bowl and mix well. Mix in chocolate chips. The batter should be firm enough to roll in to balls, about 2″ in diameter. 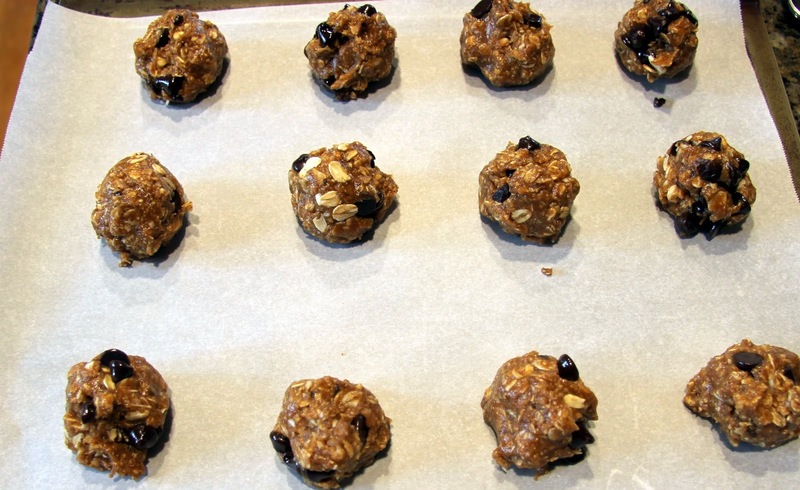 Place on prepared cookie sheet leaving about a 2″ space between each cookie. Bake in preheated oven for @ 12 minutes. Remove from pan immediately and allow to cool on a rack or another cool surface like a large plate or granite countertop. Enjoy them while they’re still warm if you can! Store the remaining cookies in an airtight container.